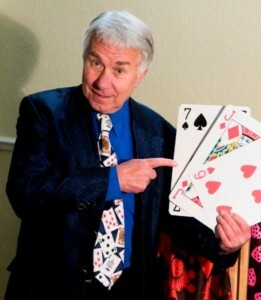 Richard Ballinger’s COMEDY MAGIC SHOWS have been entertaining audiences for more than 25 years making him one of the most experienced comedy magicians in the South West. His skills as a close up and comedy magician combine to make your guests part of the show with the laughs usually ending up at his rather than the audience’s expense. Richard’s comedy magic shows can be tailored in length to suit your event and cater for all kinds of audiences and settings. So if you’re looking at booking a comedy magician or comedy magic show for Bristol, North Somerset or anywhere in the South West please Contact Richard on 01934 418 184 or 07979 600 797. Alternatively, email him with your contact details and comedy magic show requirements at magic@richard-ballinger.co.uk and he’ll get back in touch as soon as possible.